The Newcastle art scene is alive and popping – but you might not know about it. Making the arts accessible, understandable and visible is something we are very passionate about. 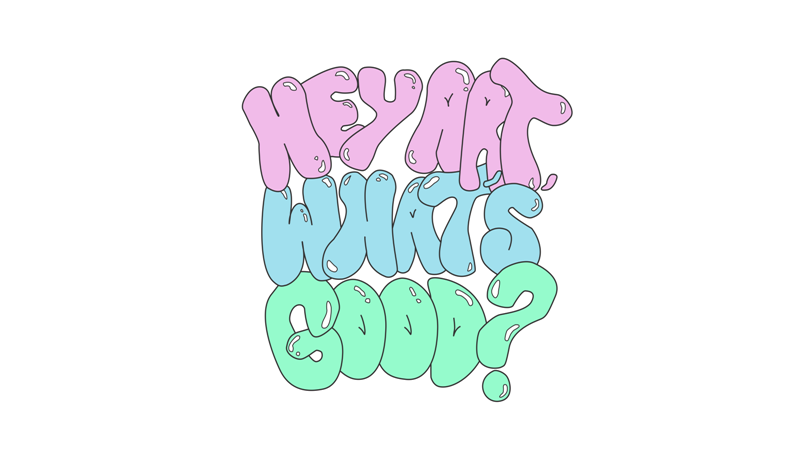 Hi, my name’s Amy, and I help run a podcast here in the North East called Hey Art, What’s Good?. Together with some friends, Alice, Rosie, and Ellie, we work to create and distribute our podcast and raise awareness of art in the North East. The four of us are Geordie lasses who have been friends for years (Alice and I are also siblings), and we just really love art! Our journey began almost a year ago when we sat down to record a separate podcast episode for Alice’s workplace. Once we finished, we all sat and thought about how much we wanted to do some more. Thus, Hey Art, What’s Good? was born. We all love art and have grown up visiting galleries, learning about art history, and even creating art in our own ways. We’ve grown up in Newcastle and came to realise that few people, including ourselves, were even aware of the bustling art scene in the North East. There’s a lot about our podcast that we think makes it special. We noticed that there’s lots of discussion around art, which can be great and very valid in its own right. But a lot of it can be critical, intimidating and alienating for people who aren’t a part of the ‘art world’. We wanted to shine a spotlight on the North East and encourage a conversation about art in a more casual way. We like to focus on the positives of art rather than criticisms in our episodes. Nothing is more off-putting than having other people criticise something before you’ve been able to give it a chance. For anyone who’s interested in checking out what we’re doing here, it’s pretty easy to find us. You can access all our episodes and blog posts via our website. You can also find our podcasts on all major podcast platforms (Spotify, Google Podcasts, Soundcloud, iTunes etc.). Our podcast is super casual to listen to and it’s the perfect thing to stick on when you’re doing something else. We also want to get involved with doing more talks and events to make more people aware of what we’re doing and connect with local artists and organisations. Follow our Twitter and Instagram to stay up to date with that or get in touch with us about it.